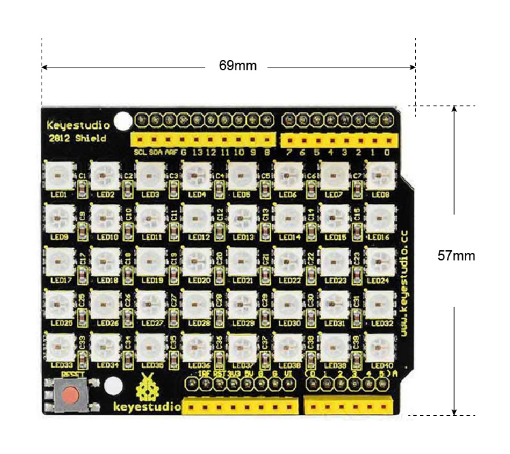 keyestudio 2812 shield adopts stackable design compatible with UNO board. 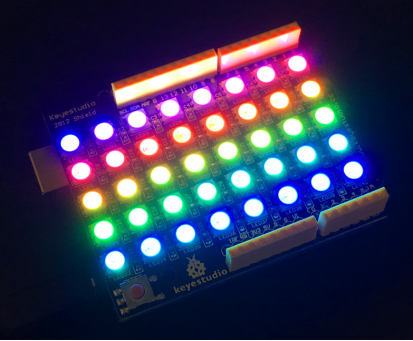 It is an intelligent controlled LED light source that the control circuit and RGB chip are integrated in a 5050 SMD component. It includes intelligent digital port data latch and signal reshaping amplification drive circuit. 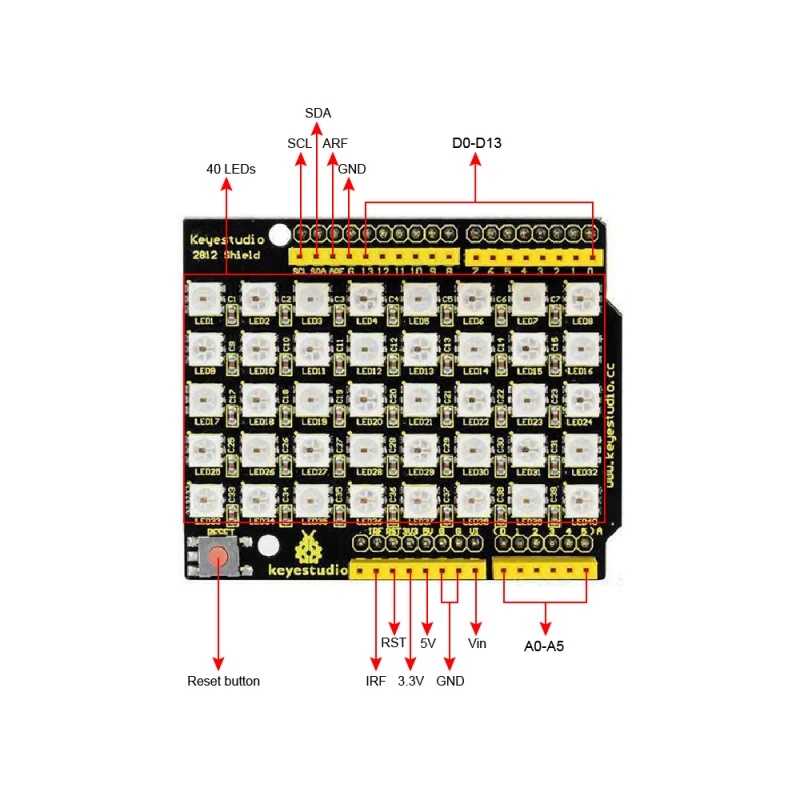 Also includes a precision internal oscillator and a 12V programmable constant current control part, effectively ensuring the highly consistency of the pixel point light color. The data transfer protocol uses single NZR communication mode. After the pixel power-on reset, the DI port receives data from controller, the first pixel collect initial 24bit data then sent to the internal data latch. LED has the advantages of low driving voltage, environmental-friendly, energy saving high brightness, large scattering angle, good consistency, long life span, etc. Anti-reverse protection circuit, the reverse of power supply will not damage the internal IC of the LED. IC control circuit and LED point light source uses the same power supply. 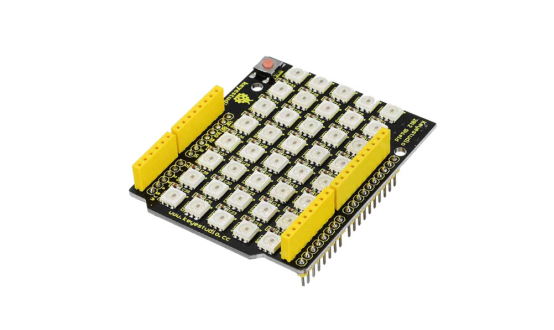 Control circuit and the RGB chip are integrated in a 5050 SMD component, forming a complete control of pixel point. Built-in signal reshaping circuit, signals received will be wave-reshaped first and then output to the next driver, ensuring wave-form distortion to not accumulate. Built-in power on reset circuit and power-down reset circuit. Each pixel of the three primary color can achieve 256 brightness display, completed 16777216 color full color display, scan frequency no less than 400Hz/s. Serial cascade interface, to complete the reception and decoding of data via a signal line. When transmission distance between two arbitrary points is no more than five meters, no extra circuit needed. When the refresh rate is 30fps, cascade number no less than 1024 points. Data sending speed can reach 800Kbps. The color of the light is highly consistent, cost-effective. Built-in driver IC with reliable performance. Use hard plastic for packaging, preventing press damage. Simply stack the shield on UNO BOARD ,then connect them to your computer using a USB cable. How to download and install the Arduino IDE and driver . Or click here to download the code or directly copy the code below. Note: Before compile the code, do remember to add the necessary libraries inside the libraries directory of Arduino IDE. 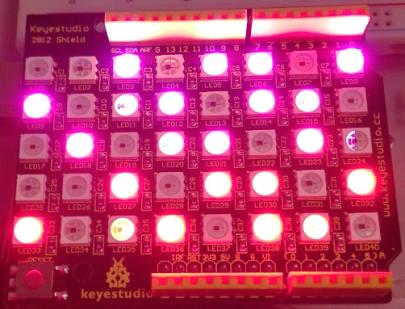 Done uploading the code above to the board, you should see the LED matrix blink with shiny colors.